GROUND ZERO PLUS 1130 DAYS,--New York, NY, Friday, October 16, 2004-- A child walking down the street in New York City, as well as other liberal hotbeds in America, get clubbed visually by adults eager to violate one of the most sacred tenants of parenthood--protecting children from unwarranted abuse. Women battering the President with baseball bats. Take the word "beat" and play it out in your adult mind. Beating someone isn't about winning. Beating is all about battering, pounding, smashing, hurting, maiming, obliterating. To beat someone is to go far beyond the limit of victory. It is about sinking down into the primordial ooze of human nature where bitterness, anger, hatred and all the violence that fuels this base emotions erupt in a fiery effluence, burying the opponent in a scalding, scorching sea of political lava. What does this tell a child about the people who are advocating their Presidential Prospect--in this case, John Kerry. To a child, the theme Beat Bush isn't about John Kerry being a better man, a better leader, a better Father of the Nation, but rather a bigger bully. And, they usually are afraid of the person they want to beat. If they promote "beating someone" they aren't promoting why they are better. Instead, they are promoting simple, pure violence. They are telling children to eliminate the competition and then step up in the vacant space. In other words, if we kill the King, then there will be an empty throne, and the contender can climb up and take command, not because he or she is more qualified, but simply because the King has been beaten to a bloody pulp. 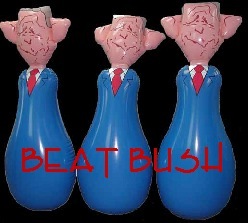 I am sure there are many who will see the Beat Bush buttons from an entirely different viewpoint. That will be because they are blind to the eyes of children. A true and honest person will ask young children what it means to "beat someone," and to tell them the difference between the word "beat" and "win." Sadly, some of the comments will include: "Beating is what my daddy does to my mommy!" People who wear ugly, vile buttons that incite the riotous nature of human violence serve only to fuel the Beast of Political Terror in children. This is an ugly election on all sides. 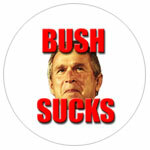 Even uglier are the Beat Bush buttons. And, the people who wear them are Beasts of Terror trying to disguise themselves as political advocates who have the "right" to promote their views. But when the right to promote a view encourages a child to consider abuse of another as the goal of obtaining the highest office in America, there's something rank in the veins of those who should know better. 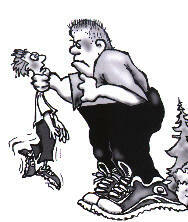 That rank odor is stupidity and selfishness, all at the expense of the Children who suffer the sores of violence. Go To Yesterday's Story: "How Easy It Is To Become A Victim Of The Beast Of Terror"